After a long search I still only have this gilet. I've worn it on my grey jacket a few times and I'd say it works quite well. They're quite similar stylewise, and the colors play along. 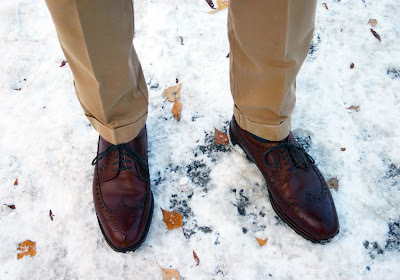 This time the other pieces were a simple white shirt, slim khaki chinos and my longwings. 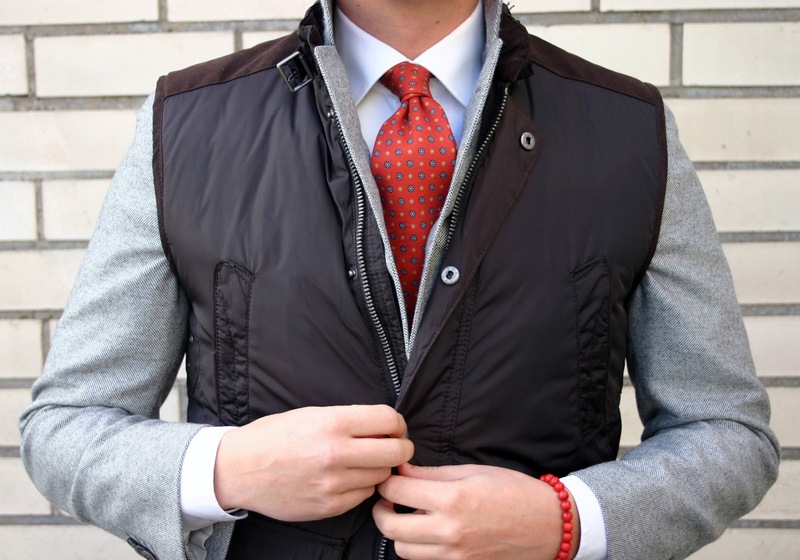 Details include a rust red silk tie, red coral beads bracelet and a dark brown bridle leather belt. Underneath a white cotton pocket square. 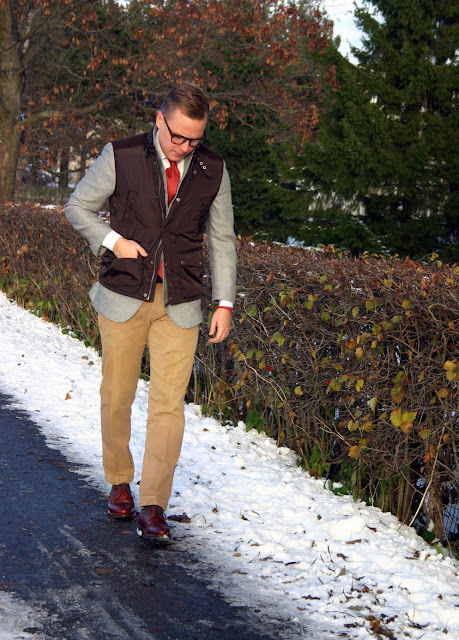 The cashmere wool jacket and the gilet on top keeps the warmth well and after a walk to the nearest grocery store I was actually more hot than cold. Really love this tie, and the colors pops up nicely without being too bright. The shirt is semi-heavy cotton twill that's pretty comfortable in the zero degreeish weather. 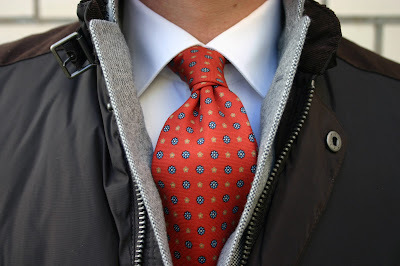 A bit sprezz knot adds a nice touch to the overall outfit. The shoes are not the perfect shape, but the leather has been a positive surprise. When worn with slim chinos or jeans they're actually quite handsome. The thicker sole brings that bit of heaviness and roughness needed when the weather gets colder, and the colors is rather beautiful. That's a good way to find some positive from dropping temperatures. Did you get that double breasted gilet btw? No, I decided to cut the chlotes budget and save up for a timepiece. Snow already. Worse than Canada. On an unrelated matter, do you have Hallowe'en in Finland? I've never been to Finland but I'm sure it has some incredibile places that look surreal in wintertime. And given that it probabily is the most developed country in Europe I'm sure it has the problems the population is facing with the snow all sorted out. So snow already? It's very funny to me how you see snow as such a bad thing, assuming the roads are clean, what's so bad about it? If I'm lucky I get 3-4 weeks of snow dispersed for the whole winter and almost never arround Christmas. Since my girlfriend went to study in Switzerland this year I hope to spend the winter holidays totaly surrounded by snow. I have to agree, some places look pretty stunning during the winter and snow isn't a problem. Lapland (Levi for example) is really worth a visit during winter.